Our firm is specialized in providing filtered raw data and analyzed roughness either to mean line or best fit arc. Five filter options on gaussian, phase corrected and 2cr. 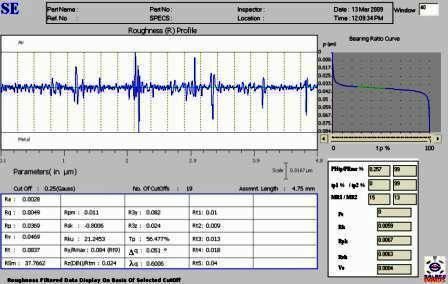 Over 26 parameters are available in roughness modes. Advanced parameters like vo, rmr, mrl, mr2 are provided optionally to the client base. Our enterprise is a known for developing Retrofits (comprising of Electronics,Analysis Software)and supplier of New Roundness, Roughness and Contour Machines. Besides, we also provide services for these machines. Our product line is highly acclaimed in the market for variegated traits like robust designing, supreme performance and low maintenance requirements. With our expertise, we also provide PC based retrofitting and services for upgrading kits for existing metrology instruments and machines. Additionally, we are involved in providing Calibration , Repair services to a wide range of surface metrology instruments. Our other products are 1) Parking Reservation Systems. 2) Automated Timer / School Bell. 3) Electronic Components Inventory Management System. 4) Door Access Controls System. 5) Motor Speed n Position control and many more. Our core management team possesses personnel, who help in the proper functioning of diverse areas such as strategy & organizational development, policy making, technology up-gradation and outreaching target audience. We are in possession of capacious warehousing unit, which is centrally located allows us to store sufficient amount of raw material & devise proper retrieval facilities for preciously designed equipment. Our firm has quality testing laboratory, which is equipped with ultra modern machines and equipment to access the product line on various parameters. You can also visit our sister concern Website.